Tomorrow, my buddy and I will be taking about six months of accumulated metal to the metal recycling place. My buddy has all of his neighbours trained to give him any unwanted metal items they may want to get rid of. He also has a son-in-law that has a father who does small engine repair and sometimes there are small engines that need to be junked. I generally don’t have much but this time I have an old dryer and an electric lawn mower that has trimmed its last blade of grass. Plus a few pounds of assorted metal from here and there. One of these days I will clean the garage and have a ton of metal to recycle. We don’t do this for altruistic reasons, strictly for profit. Once we took it to the city landfill just to get rid of it and were charged about $50. The thing that hurt was we had to dump the metal in a Calgary Metal Recyclers bin. That was the last time. We don’t make a lot of money generally, just enough for a few coffees. The last time Ken had a lot of aluminium and copper wire which is worth top dollar. The best part of the trip is to watch the massive cranes grabbing a huge load of shredded metal and tossing it onto another huge pile of shredded metal. I would love to use the big electro magnet to pick up a car and then drop it from as high as I could. That would be awesome! 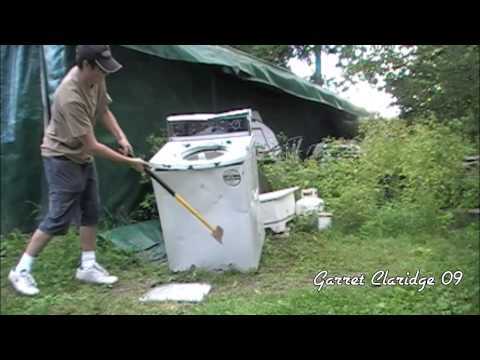 In preparation for tomorrow, I had to smash my dryer down as flat as I could. Lucky for me I have a huge cartoon type sledge hammer and some anger that I needed to deal with. You may or may not be surprised to learn that they make those dryers to be pretty sturdy. I wailed on it until I was sweating pretty hard and it would be difficult to determine what it was at first glance. We eventually called a truce. I stopped hitting it with the sledge and it would stop making me sweat. I needed to take all of the plastic off and for the most part a hammer did the trick just nicely. I still had some anger. I took off the inner paddles which cause the drying clothes to bounce around inside the drum. Inside the paddles were voids which over the years had attracted tiny bits of lint. Those tiny bits of lint trapped inside the revolving drums eventually turned into little felt balls of varying size. When I first saw them I though they were little metal balls that had some mysterious purpose. I held them in my hand and marvelled at the perfect little balls. I wondered if the Mongols discovered the felt they use to build their Urts. Of course they didn’t have huge electric dryers in the thirteenth century, but perhaps the principal behind my little felt balls and the houses of the Mongol hordes were the same. No…probably not. It is kind of a weird idea though to think that little balls of fluff could have helped to conquer the ancient world and be responsible for the spread of civilization.